Wandani. The word doesn’t seem to belong in inner city Milwaukee. It means “companions” in Swahili, say the organizers of Wandani Youth Outreach, a program sponsored by St. Marcus Lutheran church and school located at the corner of Palmer Street and North Avenue. Wandani’s mission is “to bring the gospel of Jesus Christ to the inner city of Milwaukee and to assist urban youth to prepare for lives of positive service to their communities,” according to the program’s literature. So it is perhaps appropriate that the word wandani varies its meaning depending on context: in addition to “companions” it also means “allies” or “followers.” “For us this is a Christian ministry,” says Peter Fraser, Wandani’s director. “Of course behind it is the Christian faith. We don’t force that down people’s throats,” he says. “We try not to proselytize.” Wandani started modestly with a grant from the Wisconsin Evangelical Lutheran Synod (WELS) in 1997. Funding has also come from the Christian Stewardship Foundation and the Kid Brothers of St. Frank. From an evangelical community study group meeting once a week, the program grew to include Bible study, arts and crafts, karate and open gym. In 1999, Fraser and two others took over Wandani and it started to assume its current shape. Today there are Wandani activities every day of the week except Friday, including the recently added girls’ night and liturgical dance. Basketball is still the biggest hit, with junior and senior high open gym Monday and Wednesday respectively, and Wandani Wolves club games Thursday and practice on Saturday. “Most of the parents are really grateful there’s a safe place for their kids to go,” Fraser says. 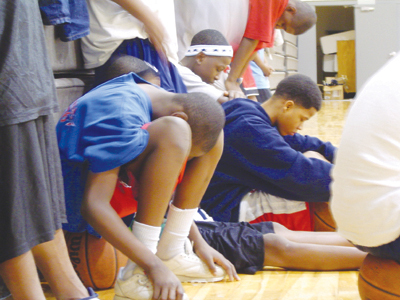 “It’s About God” (And Basketball) The program provides a surrogate family for urban youths — an explicitly religious family, and one both its leaders and participants say helps develop a sense of discipline and respect for authority. “It’s about God,” says Daron Evans, 15, a Wandani regular for Monday night basketball. “It’s just like roots, like our house rules and stuff: Don’t cuss, don’t yell, don’t argue with your brothers and sisters, ’cause one time you’re going to need them.” A three-year Wandani veteran tells a similar story. “Before I came here I didn’t want to listen to anybody,” says Tim Groce, 14. Now he says he listens and uses respectful language. Both boys say they think they would be in trouble if not for Wandani. Leaders cite an altercation that almost happened as evidence of the values Wandani instills. “There was going to be a fight, but one of our guys stepped up and made it stop,” says Brian Davison, St. Marcus staff minister who supervises basketball Monday and Thursday. “It looked like it was going to be a gang fight right here in our gym.” Davison says he was later told, “You know, Brian, the only reason nothing happened tonight is we respect what you do.” Wandani alumni have also stepped up as program leaders. One of them is Marvell “Dean” Jewell, 20, now a paid staff member who referees basketball games. 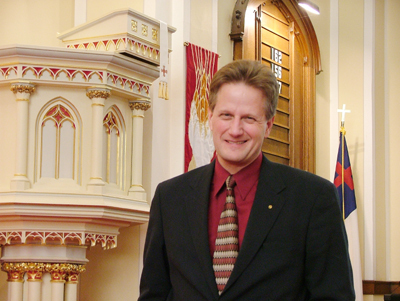 Jewell has since joined St. Marcus church. He says he can relate to kids because he was in their position. “The biggest thing is respect. Good sportsmanship. Knowing how to carry yourself,” Jewell tells his “little brothers.” And at the same time kids are having a good time, Jewell says, they’re learning about God. During each Wandani session, a leader reads a Bible passage and interprets it. Kids in gym shorts roll their warm-up basketballs away and gather at mid-court to sit and listen silently to the Bible, as Davison tells them about heaven and hell — everyone will be judged, he says, but you must be a believer to enter heaven. After this “devotion,” the teenagers take the court. A Sense Of Identity Wandani has attracted some 150 regulars per week to its various programs, says Fraser, because it fills a void in their lives often left by absentee fathers. “It also gives kids a sense of identity. A lot of these kids don’t have that,” Fraser says. “The kids lack that sort of vertical relationship people need to find out who they are.” Problems in family life also combine with deficient public education to alienate urban youth, Fraser says. “Their [nearby public] schools really are horrific,” Fraser says. “There’s no reason [for kids] to feel pride in their schools. We try to create a sense of identity in a program that gives kids a sense of pride.” In the process of generating such pride, Wandani has also been an effective recruitment tool for St. Marcus school, having attracted 70 new students through the program. And kids in Wandani Wolves tee-shirts continue to spread the word about the program. “It’s not brain surgery,” Fraser says. “We just establish really good relationships.” Systemic Problems Remain Yet while Wandani addresses the symptoms of urban poverty, the program does little to address the socioeconomic systems at its root. “There are a lot of people working really, really hard to hold their families together, but they’re handicapped by their economic situation as well as education,” says Fraser. “The kids end up being the victims.” Hard socioeconomic realities must be confronted to escape the cycle of the urban — primarily black — poor, says Florence Johnson, professor of educational policy and community studies at the University of Wisconsin-Milwaukee. “The problem won’t go away with the Wandani program. The reason for the problem is they’re [white society is] stemmed in racism. You have to understand the historical situation…that’s the only way people can be transformed about sharing power, sharing wealth.” The social pattern that has historically denied blacks educational and economic opportunities is old, Johnson says, dating from before slavery — and it continues today. “The power has never been shared,” she says. Given the present political climate, she doesn’t see positive systemic change happening anytime soon. And Wandani may be an instrument in a larger national struggle. “What hurts us is exploitation of black Christian people in America,” Johnson says, since the “black church was the backbone of the Civil Rights movement.” For example, she says that to secure votes, George W. Bush “preyed on the humanity of black churches. They voted religion. Now what we have is at least 50 percent of black churches in the camp of the Republicans.” The problem with that is, Johnson argues, that the conservative policies of President Bush — like those of President Reagan — turned back the strides for equality and urban justice made by the Civil Rights movement. So by evangelizing predominantly black urban youth through the Wandani program, the theologically conservative WELS would gain followers who may come to ally themselves with a politically conservative agenda — to the detriment of their own urban communities. “On the one hand, any time one child has a better self-concept, that child may advance enough to get to college,” Johnson says of the benefits of the Wandani program — offering a supportive community to children with little else. On the other hand, she says, those students who do advance are exceptions while a majority are denied opportunity by an unjust system — one which remains outside of discussion. Faith For The Future? Wandani leaders say they are preparing kids for work in the real world. “Our goal is to train them to leave our little nest of Wandani,” Davison says. To that end, Fraser wants to turn a former funeral home at First and North Avenue into a business for Wandani youth. It may include a coffeehouse, a music therapist and school store where Wandani youth can get hands-on employment experience. Fraser envisions the business growing as a co-op where Wandani participants literally take ownership of their work and pride in their labor. “That’s one reason we’re making it a cooperative corporation — the kids will not just be wage slaves,” Fraser says. He also envisions Wandani taking over the cleaning of St. Marcus, taking ownership of vending machines and possibly running a lawn service. He says he also hopes in five years the program could be self-sufficient, driven by responsible Wandani alumni. About 40 volunteers sustain Wandani now, many of them students at Wisconsin Lutheran College, where Fraser is chair of the department of modern language and a professor of English. One of them is Rachel Neumann, a senior psychology major. Neumann remembers how good she felt when the hospitalized mother of a Wandani youth phoned to thank her for helping her son bake cookies and make get-well cards. She now plans to work with urban youth after graduation. So Wandani is making an impact. On a bulletin board in one of the Wandani activity rooms, one child has painted a blue and green watercolor Earth hanging in space, writing alongside it that: “The world makes me feal [sic] good, loos [sic], and free.” That loose feeling of hope may be the best thing Wandani offers urban youth, says Johnson — because while socioeconomic status is the first factor affecting how well children learn, a sense of futility is the greatest factor contributing to academic failure.